The online Course Schedule provides general University information. See the links on this website's side navigation menu for more details. The Course Schedule also contains class listings and associated information. Fields of study are arranged alphabetically by college and academic unit. See the "Registration rules by department" link on this website's side navigation menu for administrative officers, contact information, and requirements related to registration. 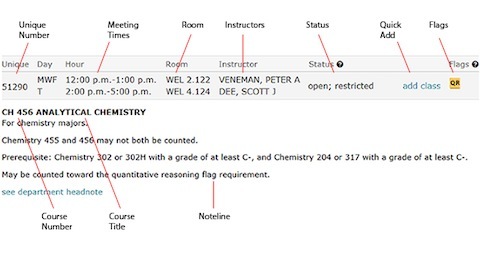 When searching for courses in the online Course Schedule, results will look like the example detailed below. Three-character field of study abbreviation followed by three-digit number. Summer courses have a lowercase letter before the number to indicate term: f-first term, s-second term, n-nine weeks, w-whole session. Name of the class. Follows course number, and applies to all sections listed after it until a new course appears. Information including course description, prerequisites, enrollment and other restrictions, and related courses. Applies to all sections of the course. A five-digit number identifying a particular section of a course. (This number is required to register). Clicking a unique number link opens a page with class details. Days of the week the class meets are listed by their initial letters (MTWTHF). For example, MTWTHF means a class meets every weekday (Monday through Friday) during the term. When multiple timelines are displayed, typically the first timeline is the lecture, and the other timelines are the required discussion or lab. Students must attend all listed times. (Classes may meet on additional days not noted in the meeting times. Check the syllabus or class details page for this information.) Class hours follow the weekday. » Also see meeting time in the glossary. The building and room where the class meets. Buildings are abbreviated with three letters. » Also see the list of buildings and their abbreviations. The person teaching the class. If no instructor is listed, then the instructor has not been assigned. The real-time registration status of a course section displays online, and includes classes which are open; restricted to specific majors or students, closed, waitlisted, or canceled. This link takes students directly to the registration system to add the class if it is open and available. This feature is a result of receiving feedback from students including representatives of the Student Government Association and the Senate of College Councils. Skills and Experience Flags may be required to fulfill an undergraduate degree plan’s requirements. Refer to your catalog or consult your academic adviser to determine which Flags are required for your major and to learn about earning each Flag in the process of completing the major, core, and other degree requirements.